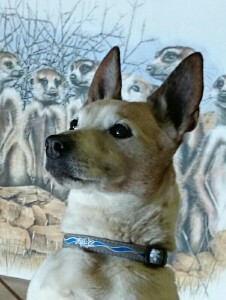 Those of you who have visited us for a holiday or just to “come and look” will, most likely, have come across our very special little Jack Russell, Muthi. Muthi originally belonged to our neighbours, but about 12 years ago he decided to come and live with us. 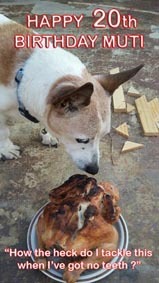 It might have been because of the two attractive female fox terriers that we owned! 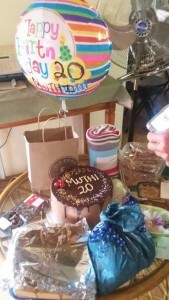 Last week, Muthi celebrated his 20th birthday ! Probably the mountain air and lack of stress, you might say. But, add to that plenty of love, an incredible strength of character and will to live, and that’s why he is still around today. 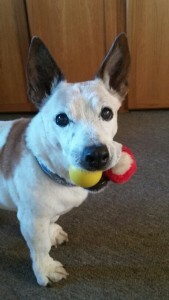 Even though he’s going blind and deaf, and lost most of his teeth, he’s always ready for a game or a walk. Heart pills twice a day for the last 2 years have helped to keep him with us. Steve has a shop in the Valley where he sells his artwork, and the “Undercover” painting is always an attraction. Especially if Muthi is at the shop in “person” to meet his admirers. One can’t help just loving him! 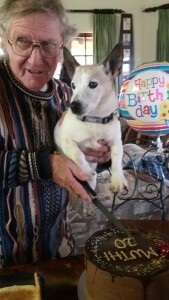 We celebrated his 20th birthday with a brunch last Sunday with a few of his/our friends. What a special day it was, in honour of a very special little friend. Hi Estelle and Steve, what a lovely story and hope he carry’s on a lot longer. We just lost our Tibetan Terrier after over 17 years so pretty devastated. Go Go Muthi!. Steve was so delighted to hear from you and he would love to see you again. Perhaps you could visit us around the middle of February, when the Drakensberg Boys start having their concerts again. They’re right next door to us and you’ll love their performance. As soon as you have a better idea of what your plans are, you can email me on estelle@futurenet.co.za, or submit an enquiry via our website. SO So Happy Muthi is still around , my self and Lucinde are more than likely coming in December for a couple of days think we are waiting for confirmation of our dates , We stayed with you about 5 or 6 years ago and Muthi stayed with us most of the time , cant wait to see everyone again. Hi Jason, it’s good to hear from you again. I really hope we can accommodate you in December. I think Lucinde has sent in an enquiry, I’m just waiting to hear from somebody that I offered it to first (sadly!). You’ll see quite a few changes around our spot, and although Muthi’s still going, he’s slowed down a lot too! Thanks again. Chat soon. Regards, Estelle. Seems like you guys are fully booked so we cant stay with you , but no matter we are staying right next door at the Rock so we will pop over with a present for Muthi and a alcoholic beverage just to say hello. Hi Jason, so glad you’ll be able to pop in! We look forward to seeing you again. We met Muti around 16 years ago when he was still at Dragon Peaks. We spent many a fun walk accompanied by Muti and when we left, we begged to take him with us. We’re so glad he’s still alive and we will cherish the memories of Muti forever. It’s so good to hear stories of Muti and his escapades. He certainly was a popular visitor to Dragon Peaks. If you’re ever at DPP again please come to Highlands and visit him again! So good to hear from you. Sorry about your doggie too. Sad, but it was Muthi’s time! Hope you’re going to be able to visit us again sometime! !